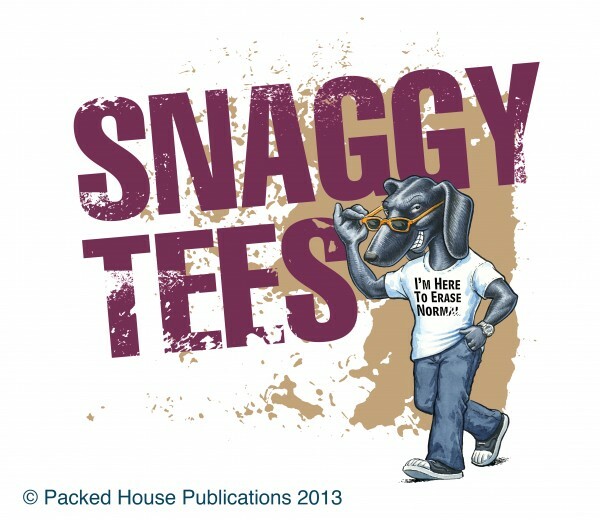 Packed House Publishing needed a logo for their T-Shirt business – Snaggy Tees. The brief was to incorporate a T-shirt wearing, anthropomorphic dog. As an initial response I pitched in a whole slew of doggie faces for feedback. The core business is men’s shirts, so, logically, I did quite a few blocky, masculine dogs. However, amongst other breeds, I dropped in a dachshund, probably the least ‘blokey’ dog I put forward. A few years ago I did a plate for Danbury Mint in Connecticut which included twelve dachshunds, so I was familiar with the shape. That familiarity must’ve worked because the masculine animals were all trounced by the sausage dog. The final appearance was ‘tuned’ slightly at pencil stage, but I still think there’s an element of dachshund about him. Once I had a head to hang the body from, all the rest was plain sailing and the client was delighted with the result.